Hey Arnold! 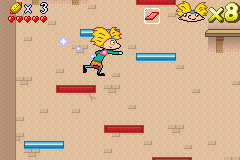 The Movie is, surprisingly, a licensed game about Hey Arnold. To everyone's surprise, it's playable, and to everyone's even greater surprise, it has nice controls, smooth gameplay and good music. Scheck buys up most of the neighborhood where Arnold lives so he can build a mall, and Arnold and Gerald have to find a document that declares the entire area a national monument before the bulldozers start tearing everything up. Yes! This is one of my favorites GBA games and one that I played a lot when younger. It really shines across a sea of bad licensed games with its gameplay, graphigs and a really good OST. A fun game to play casually that I wanted to give a tribute :) I TASed this in two weeks, going at the pace of one level per day (with a small break after 3-1) before deciding to spend my full time in doing this project and did the remaining three areas in a day each. The gameplay of this game is your average platformer. Most of the levels have a goal: usually it's going to be 'get to point B from point A'. Occasionally, you'ill have some other goals, like 'deliver flyers', 'collect 5 objects around the level' et cetera. You get to play as 4 different characters, with their only differences being weapons and recovery times (see Bunnyhopping). The main mechanic of this game, though, is its power-up system. Powerups are special in the way that they last indefinitely until you die, a la Mario. This means a powerup picked up very early can dramatically change the whole run. There are two types of powerups: the weapon changes and the character powerups. Weapons changers change your weapons. There are three in the game: default (chewing-gum for Arnold/Gerald, denture for Grandpa, and toilet paper for Grandma). These defaults are fired with B and go in a straight line. The major difference between chewing-gum and the two other defaults is that while chewing-gum will apply a short stun, the denture and toilet paper will apply a knock out. If enemies are knocked out, they lay on the ground for more time than when they are stunned. However, you cannot actually kill a knocked out enemy, but you can kill a stunned enemy using the elbow (R). The second weapon is the tomato, which fires 3 tomatos in a wide, shotgun arc that will knockout any hit enemy. However, it has very poor range, and is weak against fast enemies. The last one is the basketball, which goes much farther than the bubblegum and will rebounce off the ground, going in a line. It it weak against small enemies. There are three character powerups, two of which are picked up in the run. The first one is the shoe, which makes your jump significantly higher and allows you to execute the glitched hyperjumps. The second is the chocolate bar, which powers up all the weapons you pick up: the chewing-gum will stun for longer, tomatos will go farther and the basketball will rebounce 7 times instead of 3. The last, and perphaps most crucial upgrade is the skateboard: it allows you to enter running mode after walking for 3 frames, which makes you go significantly faster. One last pickup you may see is the golden tomato. This is not a powerup; it is just there for 100% purposes. Getting all the golden tomatos gives you a secret unlock code, and is effectively 100%ing the game. There are passwords in this game, but none are used, for obivious reasons. There's also small rugby balls that you can pick up. 100 and you get an extra live. My secondary goal was to pick up as much as possible: I end up with 8 lives at the end of the movie. You may wonder why I spam the elbow most of the time. This doens't save time anywhere (apart from lag reduction); I just find the animation funny, and it livens up the movie quite a bit. In laggy levels (the only one being the middle of 1-2), doing an elbow while the game is lagging resets your animations and reduces lag by 5-6 frames, for some obscure reason. Bunnyhopping is the main trick of the run, used almonst everywhere throughout the movie. When running, every single other action will waste time: Shooting and elbowing (unless you're elbowing in the air) will put you back into walking. Jumping doens't waste time in itself (it is as fast as running) but, upon landing, you will have recovery frames. The recovery frames are different for each character : from the very short 4 (for Arnold), to 6 (Gerald and Grandma) to the huge 22!! (Grandpa). These are problematic because they slow you down to a crawl. Thankfully, jumping again when you're about to hit the ground will skip these recovery frames. This is abused throughout the entire run and saves a huge amount of time. Clipping in this game can happen in two occasions: horizontal clipping and zipping. Horizontal clipping is the fact of doing a jump high enough on a one side platform (a platform which can be accessed from the sides or below, but is solid above). Jumping just high enough will simply push you up. Inversly, this can be used to clip in staircases: doing a pixel-perfect jump to hit the side of a one-way platform (which is what stairs are made as) and clipping through the staircase. This can be also done in reverse to clip up into stairs instead of clipping out. Note that for pixel-perfect clipping, you need the most optimal vertical speed. This can only be gotten from a running start and NOT from bunnyhopping. Hyperjumping is done by shooting before the peak of your height of your jump. This allows you to reset the jump animation, gaining extra height as long as the animation is active. This allows you to break some levels. However, since shooting reverts you into walking speed, it is only used when absolutely needed. Used in 1-2 and 5-3. While in the air, normally, going in an opposite direction than the one you're going (for example, left to right) will kill your speed. Hovewer, alternating left > right > left > right while waiting in the air (to wait for a cycle, for example) will preserve maximum speed. If you wonder who the composer for this game is, he's Tomoyoshi Sato. Check him out. The first level of the game is the longest and, arguably, the most boring to watch. We won't get the skateboard until 1-2, so until then, it's a race against the clock to see how much you can make the fact of holding Right and moving painfully slow somewhat exciting to watch. The plot here is simple: Arnold's area is going to get destroyed and replaced by a big mall. He gathers all his friends to protest against the mayor - I mean - a talking TV. Here, shooting, elbowing, and simply walking go all at the same speed. I try to mix it up a bit here. If you think this pace is fast.. wait until 1-2. In the meantime, enjoy what's one of the best tracks in the game. We also get a taste of the first enemy in the game: the businessman. Most enemies in this game don't have any attacks. The businessman is a simple man: he walks around, and will run towards you if he sees you. We pick up the first chest item: the shoe. You can note that I wait for a bit before picking up the item. This is a reccurent theme in this movie: chest pickups take a lot of frames before they are able to be picked up. I always do a jump before picking up the item: this ensures that I land on the earliest possible frame. This doens't matter for this pickup, but it will for every single one in the game. This level's objective is very different from what you're used to: here, my weapon is remplaced by flyers. Flyers are fast, knock out enemies instead of stunning them and are easy to hyperjump with. The goal is delivering a flyer in each marked mailbox. If you run out, you can refill your ammo, which I never have to do. Here, Gerald has to deliver flyers to make everyone aware about the risk that the city is towered by right now. Gerald has to deliver flyers to every mailbox around the city. The jump on the wrecking ball is pixel perfect, and was very hard to pull off, requiring a perfect subpixel position. A special thing in this game is that your subpixel position will stay between each screen: this makes hex editing close to impossible, as perfect jumps become, sometimes, straight up impossible. Not much to be done about it. I do an hyperjump to skip the last bulldozer, and hyperjump over each engineer. A dog is also seen: we're going to see more in 2-1, as well as the brown coat (I don't have any original names for this enemy..). He will run towards Gerald faster than a businessman. And then, the run-changer is picked up: the skateboard! This dramatically changes the pace of the run, going from moderatly fast to insanely fast. The change is seen immediatly. I now want to avoid shooting when unneccesary as it will slow me down and put me into walking speed. Surprisingly, hyperjumping over the bats instead of normal jumping is about 10 frames slower. There's only three days left.. Arnold, desesperate, tries to throw a big party to overthrow the demolition of the city. Gerald is late, hovewer, and has to maneuveur around a flooded park and an angry city to make it. We start off this stage by some nice moving platforms. The logs are sinking platforms: they will sink and kill Gerald if he stands on them for too long. You may notice I clip on the last log and go into the ground, under the log: this is only a visual effect. You will still sink. Other than that, this level is just some plain jumping over enemies. I have to shoot at one point: damage boosting is slower, because you would touch the ground much later, making it slower to recover the running speed. Unfortunately, the police shows up! The permit was filed, but the police didn't get a permit, and Arnold's grandma has to pay the price: she gets sent to prison. This is a boss stage! Each boss stage has 2-3 screens before the actual boss. I do a maximum jump just before reaching the cutscene trigger. This is to reach the end of the screen faster: the cutscene will not trigger until Arnold touches the ground; I use this to position myself to the right, because after the cutscene ends, Arnold will walk rather slowly to the right of the screen. This saves a little bit over one second. We get to the first boss in the game: Scheck's bodyguard. This guy is pretty fun to play around, because the stage has two ladders (which you can spam jump on) and his animations are long, giving you a lot of time for playing around. His pattern is simple: he will either taunt, up to twice, then jump after, walk furiously to your location before jumping, or walk to your location before jumping. 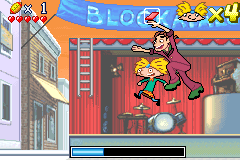 Once he jumps, if he dealt no damage to Arnold, he can be damaged. To speed up the fight, I want the boss to jump as much as possible, as in be as close as possible when he recovers. This is personally the playaround that I'm the most proud of, because it showcases a lot of movement options, and interacts with the music and the boss really well. Arnold gets told a story by Grandpa: he won the house after winning at cards against a guy during the Tomato Incident. Arnold asks what the Tomato Incident is, but before that, he has to retrieve a bunch of pictures of the incident around the house to make Grandpa remember. The gimmick of this area is that there's a lot of long, puzzling and big stages. These make them pretty fun to TAS. 2-1 starts off with Arnold having to collect five pictures around a dog, cat and pig-filled house. You also see the first horizontal clip. 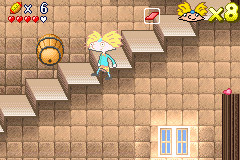 By doing a frame perfect jump into the stair, Arnold gets pushed to the right then falls downward. This saves over one second over the normal route, because it also preserves our speed! Gerald, now armed with knowledge about the Tomato Incidents, goes to contact a coroner about official documents. If they go through, the area will effectively not get bulldozed. 2-2 is the more evil version of 2-1; it's really long, hard, and has a ton of dead ends. I have to go talk to the Coroner for him to appear in the last room. We also get a first taste of the banana throwers. These will throw bananas whenever they see Gerald, making them quite tough enemies. I have to shoot at the one guarding the key: this wastes no time, because the time it takes for the key to exist makes up for it. After contacting the coroner, Arnold & Gerald learn that the document was bought five years ago by FTI. They now set out on a quest to infiltrate the building, contacted by the mysterious Deep Voice that tells them to find Bridget. 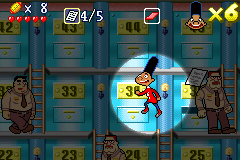 This level is rather short, but the elevator here leads to four floors! Only the second one is used. I grab the large ladder for one frame before releasing it: this allows me to boost up into the air really quickly. To infiltrate FTI, Arnold has to retrieve the key to the office, guarded by Nick. This is another boss stage with some platforming before it. Not much noteworthy here. I do execute a big skip: doing a big jump is just enough to jump off the clock tower, skipping the whole 'shoot in the clock' segment. Nick isn't a gimmick boss: for all the following bosses, you have to shoot behind them. It's the hardest to accomplish this feat with Nick, since he turns really slowly. If you have a bad subpixel position, jumping over him is pretty much impossible and you have to take damage to have a chance. Once you hit him, he doens't have any invicibility patterns: you can just hit him repetedatly. Our perspective suddently changes to Grandpa and Grandma! 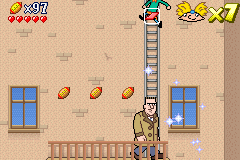 In this level, Grandpa talks to the other parents about the fact that Arnold and Gerald are risking their lives with a crazy plan. They have to find the secret tunnel to be safe. Grandpa has a different default: his one will knock out enemies! 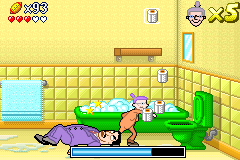 He also has the single best elbowing sprite in the game. Hovewer, he comes with disadvantages: he takes a whole 22 frames to recover, compared to the usual 4 or 6. This level doens't really shine in its design: it's going right. That's it. Grandpa decides to place TNT all around the tunnel. That's the story for this level. The objective is to place TNT around the level. This is where Grandpa's huge recovery really becomes detrimental for us: there are are a ton of doors in this level, and we waste 22 frames each time we bunny hop to them. This makes matters hard. In a lot of cases, I'm forced to suffer through these frames, when stopping to bunny hop is impossible before the door itself. 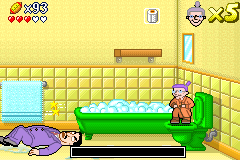 In the meantime, Grandma escapes out of the prison through a conveniently placed blown up wall. There's so much obstacles in this level it's hard to keep full speed most of the time. You'ill see me stuttering a lot to wait for cycles, of which there are a lot in this level. This is another boss level, and the platforming before isn't really worthy of any mention. But upon exiting, we meet face-to-face with the prison guard! This guy turns rather slowly: perfect to chain him. The rest is the same tactics that we use in 2-4's boss, only made easier because of this boss's slightly faster turning. Gerald, now having infiltrated FTI, must now heroically run to Scheck's office to find the document's location, bravely escaping cameras along the way..
except this level is really boring. Slippery mechanics mean that while we're recovering, we still go at full speed. The most technical achivements in this level by far are the staircase clips. Otherwhise, it's mostly running. Gerald, having found the secret entrance, has to bravely find the five pages of the document through a minefield of guards. This level looks rather easy.. but it is actually the hardest level in the entire game. This is because the location of the document isn't fixed: it's actually completely random! The seed that was picked at the end was starting at frame 68717. It beat the initial seed by exactly 1 frame, even though it waited more than 20 frames. It also looks much cleaner. After the document being burned down, Arnold, guided by Deep Voice, has to retrieve the security video of Scheck burning the document down, since it is as good evidence as the document itself. This level isn't any more interesting than 4-1: it's more running straight. Next? Arnold escapes out of FTI. This level is on the rooftops, and features a new enemy: the green small guard. This guy runs and shoots faster. That's about it. I play around with the grabbable mechanical hands. I cannot jump off them, so it's a waiting game. The Chief of Security would be an interesting fight: it's a dual fight, where he calls his dog to fight with him. However, we combo him so quickly that he never has a chance to even attack! This is the same as boss 2 and 3, except he turns even less quickly, making this fight easier. Arnold escapes out of FTI. Notice a trend? City Street is where they put all the cool screens: at the end of the game. A big skip is executed in the second screen (red construction screen): falling by the first hole down and falling down on the moving platform allows you to progress to the door, skipping one third of the screen. For the moving platform screen, we want to land down right. This is executed by landing on the first platform at the earliest frame, then slowing down on purpose so that when Arnold jumps, he starts with walking speed. This allows me not to land on the second platform. Landing on the second platform instead of avoiding it would be slower because if you fall off that platform, you need to wait around 1.5 seconds to get fully down. This is why we slow down. Gerald escapes out of FTI. Notice a trend? This is the obligatory autoscroller, and there's zero way to make it faster, so I try to make it as entertaining as possible with camera angles and jumping to the music. To display what Scheck has done, Arnold gets to the top of town to run the tape on the Sheckovision. This is, for me, the coolest level to TAS, and definitely the coolest to watch. There's a lot of sick tricks here. The second screen introduces a new mechanic: springs! These set you at max velocity upon stepping on them. For some reason, they are used in only one screen out of the entire game: this one. 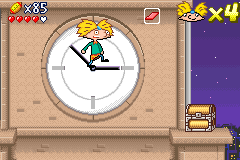 You may notice that the camera takes a while to scroll up to Arnold: this is because we travel so fast up the camera has trouble catching up. The fourth screen is the switch room, and it has what may be the neatest strat in the entire game. I get through this screen without even using a switch! The normal way to get through this level is flick switches, which triggers the opposite polarity of platforms, continue, et cetera. But this is a little different: I start with an hyperjump up to the platform. This skips the first set of levels. Another hyperjump is used to get up to the second wooden platform, saving another jump. Afterwards, the third hyperjump is done on the blue platform above the switch to get up to the last blue platform, after doing a last hyperjump to get up to the door. The lastest is the hardest because it's a frame perfect clip on top of being a frame perfect hyperjump. By doing these hyperjump antics, we destroyed a one minute long screen down to about seven seconds. The fifth screen is a factory screen. We pull the switch and wait on the platform. The platform catched is the first platform that's avaible: no way to speed it up, unfortunately. Finally, the sixth and last screen is a barrel-heavy staircase! Looks familiar? I get on the third step and execute the first hyperjump, barely clipping up. The second clip is the hardest by far, but it's also an upwarp: I get hit and get clipped up at the same frame. Because of that, the game thinks we're stuck against a wall, and tries to clip us upward; this momentum is conserved for our next jump, going up insanely fast and saving an hyperjump! Finally, the last two hyperjumps are done on the third and second step, and we're done with this staircase. Again, this level is really technical and fun, and probably the best one to watch from a viewer perspective. Scheck decides to break the law after being humiliated and starts destroying the city! Arnold has to confront him to stop him. Sadly, there's not much happening in this fight. Scheck is based on a pattern, just like his bodyguard in Area 1. He'ill do three to four attacks before raging: this is where you can hit him. These normal attacks are either throwing a paper plane (which is incredibly slow) or stomping. Luck was manipulated to force Scheck to stomp often, and otherwhise, it's just a waiting game. Note that input ends at the last shot. This is because if the treasure vanishes, there is a failsafe: the level automatically finishes. Better lag managament and shooting on 1-2. Better door entering in 2-1. Better door entering in 3-2 (this could save up to 20 frames, potentially, because of Grandpa's huge recovery). Better level seed for 4-2. The one here was bruteforced, but a subsequent TAS will have different 4-2 enter timings and would have to bruteforce layouts again or figure out the RNG. Better subpixel position management could save a lot of frames if done optimally. ars4236: Hi again, xy2_. Overall, this was a good paced run (especially so after obtaining the skateboard power-up in 1-2). I liked your style of movement throughout, and how you strove to incorporate rhythm and choreography during the boss fights. Stage 4-2 was also notable in its much shorter length, (good work on the bruteforcing used!). Nice job!